Austal Limited has delivered a 30-meter high-speed aluminum catamaran for VS Grand Ferries of the Philippines. The vessel was designed by Incat Crowther and built at Austal's shipyard in Balamban, Cebu. The new vessel, named MV Seacat, provides capacity for 300 passengers at speeds up to 25 knots. 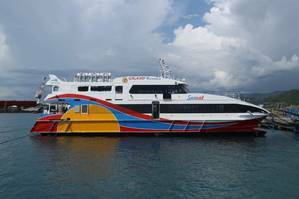 The new ferry is first locally operated vessel to be built to achieve Pioneer status, an enhanced safety standard rating in the Philippines, with the Maritime Industry Authority (MARINA). Austal said it secured the A$5.5millon contract to build the vessel in August 2017, and construction commencing in September 2017. The Seacat project met every milestone on time and on budget, according to the builder. In the last two years Austal Philippines has delivered six high-speed commercial vessels and is currently constructing modules for a 109-meter high-speed catamaran for Fjord Line of Norway, the largest aluminum passenger ferry to be built in the Philippines. The vessel will be completed in a brand new purpose-built 120-meter long assembly facility, Austal's largest outside of the U.S. The new facilities are under construction and on track to be completed in early 2019. "Austal Philippines has developed into an established and very successful shipyard that has produced high quality vessels for the worldwide market since 2012. Austal has been proud to be leading this sovereign industrial capability development for the Philippines," said Austal CEO, David Singleton. "Our Philippines facilities employs more than 500 highly skilled local employees in a broad range of professional, technical and trade roles. Austal Philippines has been responsible for developing the local SME industry and supply chain whilst also collaborating with local universities and educational establishments to truly develop a sovereign industrial capability for the Philippines."